A new role has risen for a Life Consultant based in the Midlands working for a well established, medium sized consultancy. 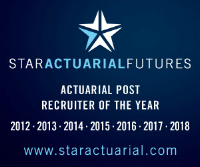 They are looking for a highly motivated, organised nearly/newly qualified Actuary to join their team. From day one you will take ownership of complex projects, be responsible for building relationships with clients as well as delivering projects to a high standard. Your relationships will be with Life Insurers, Asset Managers and Investment Banks and you will be involved in extremely varied work including ALM, capital management, pricing, with profits modelling, IFRS17 and SII so a strong understanding of Life Insurance principles is essential. In order to be considered, you will be a nearly/newly qualified Actuary with evidence of strong exam progression and academic record. You will be a strong communicator and have the ability to liaise at all levels. Your background can be in any area including reporting, capital, pricing or risk but you will have good experience within modelling. On offer is a competitive salary as well as working in a supportive and collaborative environment. The role is based 5 days a week in the Midlands very close to transport links. To find out more, you can get in touch with me on 020 7019 8881 or you can send your CV to louise.capone@goodmanmasson.com.